If you purchase modifications from Netcellent and they require new global settings, a menu will be created and placed here. Normally there is nothing here. User definable. Not all fields can be placed on the invoice. Not flexible with field length. Works with multiple forms feature per customer file setup. User definable and very flexible. Extensive fields are supported. Even though it supports multiple forms at printing time, it does not work with the multiple forms feature per customer file setup. User definable and very flexible. Four different pre-defined options. Works with the barcode label feature. User definable and very flexible. Does not work with the barcode label feature. User definable. Not all fields can be placed on the PO. Not flexible with field length. User definable and very flexible. Extensive fields are supported. Hard code format with a few options. If any of the odd numbered fields from 1 to 15 are flagged “Y”, Design-Your-Own-Form places a menu option for you in the Util-setup menu of the respective module. Each form has a default assigned in the even fields from 2 to 16. Fields 17 and 18 define how many decimal places are available for the Item List Price Discount Percent and the Item List Price. 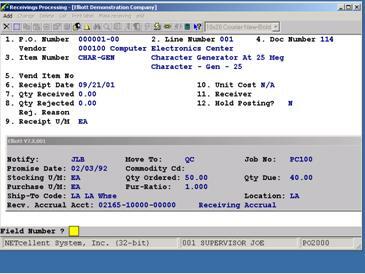 This function is implemented in the Accounts Payable, Customer Order Processing and Purchase Order modules. Please see their respective manuals on how to design your own forms. This feature hides the cost fields in AR Customer File Maintenance, IM Item File Maintenance, and P/O Receiving. This is to prevent everyday users from viewing sensitive cost information. For higher echelon users, the system will let you define five users who can view these hidden fields. 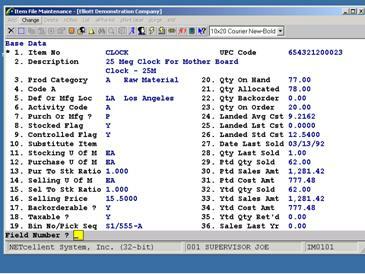 If protecting sensitive cost information is important to you, the cost in the COP line item screen and order edit list can also be hidden. This is not done through this feature, but in COP Setup by flagging fields 12 and 13 to not display or print costs. Field 1. Hide Cost In Customer File Maintenance? Answer “Y” if you wish to hide the cost fields in Customer File Maintenance. Field 2. Hide Cost In Item File Maintenance? Answer “Y” if you wish to hide the item cost fields in Item File Maintenance. Field 3. Hide Unit Cost In P/O Receiving ? Answer “Y” if you wish to hide the unit cost in P/O Receiving. Fields 4-8. Supervisor 1 - 5 Who Will Always See Cost? Fields 4 through 8 allows you to define five supervisors who will be able to view these cost fields. 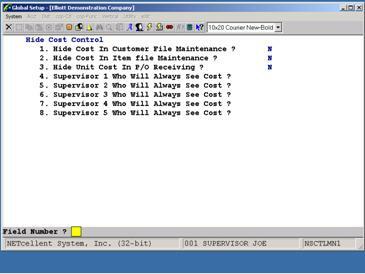 If you answer “Y” to “Hide Cost In Customer File Maintenance” and are not one of the 5 designated supervisors, you will see an “N/A” status in the cost fields (44, 45 and 46) in the Customer File Maintenance as shown below. If you answer “Y” to Hide Cost In Item File Maintenance and are not one of the five supervisors, you will see an “N/A” status in the item cost fields in the Item Master File as shown below. If you have Landed Cost enabled, the Landed Cost and FOB Cost fields will both be hidden. If you answer “Y” to “Hide Unit Cost In P/O Receiving” and are not one of the five supervisors, you will see an “N/A” status in the Unit Cost field (10) in PO Receiving as shown below. This application lets you keep track of both Landed Cost and Freight On Board (FOB) Cost. FOB Cost is the cost your vendor charges to get your merchandise to a point where you take ownership and assume the responsibility of getting the merchandise to your location. The FOB Cost plus any additional costs such as vessel freight, inland freight, duties, insurance, etc. are referred to as Landed costs. With this feature you can manually or automatically calculate Landed Costs, perform breakdown analysis, or simply let Landed Cost be the same as FOB. When calculating Landed costs, you can use a simple Landed Factor defined at the item level or aggregate the entire vessel shipment to calculate Landed Cost for each item in the shipment. Normally, import businesses and those with freight being a significant part of their inventory value should use Landed Cost as the method to value their inventory. However, this decision should be carefully evaluated with a CPA, as there are pros and cons as well as IRS requirements. By default, the system will use FOB cost to value your inventory. 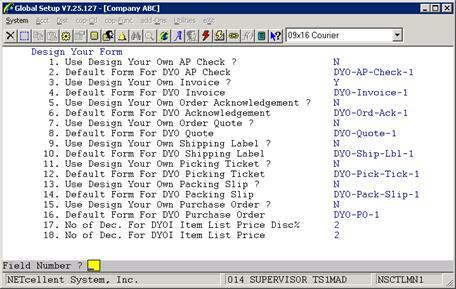 A requirement to using Landed Cost is to flag the “Distribute By Amt or Qty” fields in the Purchase Order and Inventory setup file to be “Q”, distribute by Quantity. After changing the above fields, the next step is to set up Landed Cost. Field 1. Use FOB Or Landed Cost as A Primary Cost? If you wish to use Landed Cost to value your inventory, then answer “L” to this question. If you wish to use FOB Cost, then answer “F” to this question. By default, the system will assign “F”. 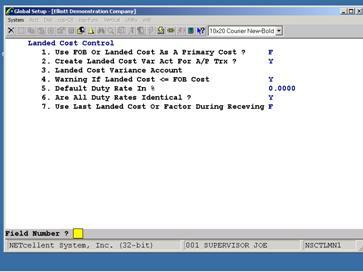 After entering “L”, a window will display prompting you to switch from FOB to Landed Cost (See figure on the next page). If you answer “Y”, the utility will run the conversion process. 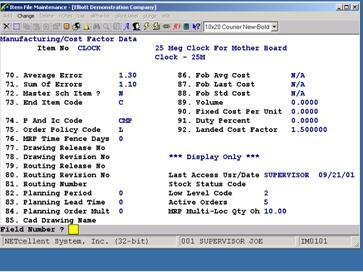 After running this procedure, the item master file will show Landed Cost for Standard, Average and Last Cost in the first Screen (See figure on the next page). The original FOB costs in these fields have now been moved to Fields 86, 87, and 88 of the 3rd Inventory Item File screen. If you are not using Landed Cost, then the FOB cost fields will be displayed in the 1st Inventory File screen and the Landed Costs displayed in the 3rd screen, Fields 86, 87, and 88. Field 2. Create Landed Cost Var Act on A/P Trx? If you would like to create a Landed Cost Variance account, answer “Y” to this question. In cases where differences are found between the A/P Voucher Actual Amt and the Landed Cost Amt (entered during receiving), this Variance Account will hold the “difference” in amount. If you enter “Y” to question 2, then you need to put in the variance account number in this field. Normally, the landed cost is greater than the FOB cost. This yes/no question allows you to activate/deactivate this warning message. Many times when importing, companies must pay duty taxes on their inventory. For this reason, duty taxes are part of Landed Cost. The rate entered in this field, will serve as the default duty rate for each new item entered in I/M Item File Maintenance. Field 6. Are all Duty Rates Identical? If you answer “N”, you will be able to override the duty % for each item when maintaining the item records. In some instances, the duty rate is the same for all items in a company’s inventory. This option gives you the ability to enforce one rate for all items entered in I/M Item File Maintenance. 2. No matter what is entered in the item file’s duty rate, the rate entered in Field 5 will be used in the Landed Cost calculation. 3. Users are not allowed access to the duty rate from within I/M’s Item File Maintenance. 2. The duty rate % entered in the Item File record will be used in Landed Cost calculations. 3. 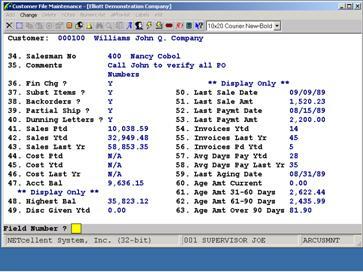 Users may override the duty rate from within I/M Item File Maintenance. Field 7. Use Last Landed Cost Or Factor During Receiving? 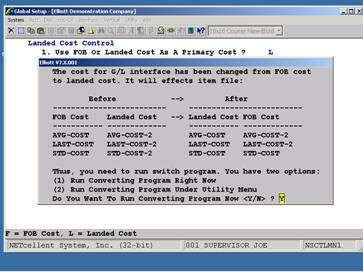 IF “L”, the system defaults, at time of PO receiving, to the last Landed Cost in the I/M file and allows you to override it. 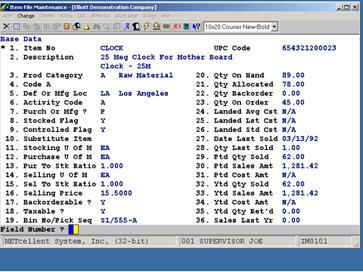 If “F”, it will use the Landed Cost factor set up in the Inventory Item file for that item. If by past experience, the average Landed Cost is 15% higher than FOB cost on a particular item, then you can set a Landed Cost factor of 1.15 for that item. At the time of PO Receiving, the PO line item FOB Cost will be multiplied by 115% to calculate your Landed Cost. Since Landed Cost = FOB Cost + additional costs, the Landed Cost factor should always be => 1. NOTE: You cannot use this function if are automatically calculating Landed Cost. Fixed Cost Per Unit: This allows you to apply an additional fixed cost to an item that will be added to the Landed Cost at time of receiving the Purchase Order. 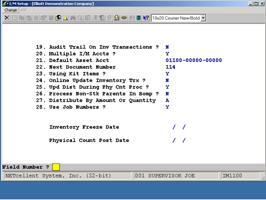 Fixed Cost Per Unit is set up and maintained in the Inventory Item File. Fixed Cost Per Unit is an option and not a required step. Vessel File: This is a required file if you wish to use automatic Landed Cost calculations. It is set up and maintained in Inventory Maintenance. For processing and calculating Landed Cost, see the Receiving Chapter of the Purchase Order Manual and the Calculate Landed Cost in Inventory Maintenance, Vessel file.